encourage exchange between professionals and young graduates. An inclusive project, CINQ HUMEURS is the creation of a 5th season that takes on many colours. From one city to the next, the piece is a vehicle for capturing, delivering and relaying local character as it is perceived by a choreographer. The impetus is to exchange, to enrich dialogue by openness another’s language, and to go to the heart of interpersonal contact. CINQ HUMEURS is inspired by one of Antonio Vivaldi’s collections, Il cimento dell’armonia e dell’invenzione, Opus 8, comprising his famous Four Seasons. CINQ HUMEURS mainly uses these four concertos, revisited and adapted by Laurent Maslé, bringing to the surface a different texture in the sound, alternatively urban, or closer to the sounds of our era. Emmanuel Jouthe then inserts a 5th season, created along with the young graduates in each of the host cities. Beyond its musical inspiration, CINQ HUMEURS is first and foremost a call for professionals and students to meet and exchange with one another. By collaborating with performers whose experiences range from 1 to 15 years, Emmanuel Jouthe aims to foster dialogue and stimulate knowledge transfer between professionals and young graduates in a way that may support future collaborations. The project also serves as an opportunity for visibility, to become more familiar in the milieu and make professional connections (with choreographers and other collaborators). In all the cities it visited, the company met with a highly creative and generous spirit of collaboration on the part of all actors involved in the project—professional and emerging dancers, producers, dance school directors, and others. 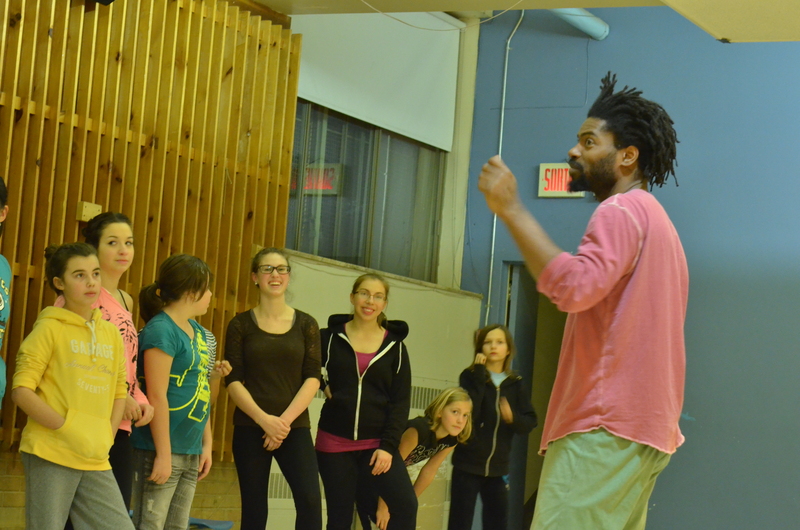 In creating these 5th seasons, from January 2009 to April 2010, Emmanuel Jouthe teamed up with 40 dance graduates spread across Montreal (LADMMI), Quebec City (École de Danse de Québec), Sherbrooke (Cégep de Sherbrooke) and Ottawa (The School of Dance). At Le Bic, the company collaborated with 4 dancers from Rimouski, each one evolving in her own community as performer and teacher. A cultural mediation element was integrated into the evening, with the company introducing an activity called Lever de Rideau, to open each performance of the piece. This element enables the artists to establish closer connections with audiences from different regions, also nurturing collaboration between the company, its clientele and producers. The initial choreographic assignment is the same for each theatre. Twenty young people from the area develop a 10-minute choreography on a piece of music by Vivaldi. The piece emerging from this encounter is shown right before the presentation of CINQ HUMEURS. It serves as the first part of each performance, which is thus renewed with each city. This activity gives participants a chance to experience first hand the ways in which a performance situation, in front of an audience, affects the body within the real-life context of a professional production. At the same time, the activity offers spectators an opportunity to hone their vision by offering different pieces relating to different processes and backgrounds, and testifying to the diversity of dance experiences. Danse Carpe Diem | Emmanuel Jouthe © 2017 | All rights reserved.